Recap is a little late so I’ll keep the details to a minimum. 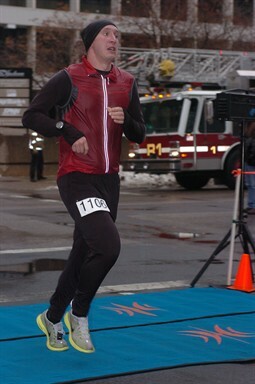 Going into the race, I wasn’t feeling great. 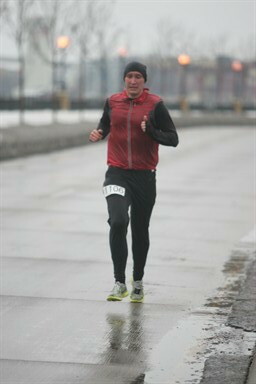 I was coming off a bad week of running where I felt extremely tired. I tried to take a few days off so I would be rested. My goal was to just get under 1:30 and ideally set a PR which would be anything under 1:29:30. That was actually the first half of Boston so I was pretty sure this would be my true half PR. I ran into an old running partner at the start, Micah, and we ended up running the first half of the race together. We tried to run about 6:40s or so and it seemed to be working. The miles went by quickly and I was surprised how fast the 5 mile mark came. We hit the turnaround at about 43:20 so my goal of a PR looked pretty good. I grabbed a gel from my pocket and quickly got a side cramp. I don’t know if the two were related or not. I tried to run it off, but I know my pace dropped a bit. Micah ran ahead but I kept him in site for the most part. I put on my headphones and did my best to keep up the quick pace. It really helped that most of the 2nd half seemed to be downhill. I passed a couple of people and just tried to keep running strong. The uphill after turning off of Shepherd Road was tough but I was just glad to finish. My official time was 1:26:37, not bad when I’ve hardly done any real training.